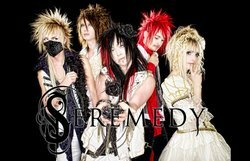 The idea behind Seremedy was created in late 2008 in Sundsvall, Sweden, by RAY and JENZiiH; but it took one year until the band got its final line-up. Seremedy is a band, not wanting to be tied to a specific genre, so they have developed a two-sided view on the world. One side of Seremedy is heavy and dark, aggressive yet melodic. The other side is more cheerful and happy, as a counter-part. Since the start of Seremedy they have gained an ever growing number of fans from all around the world. Only 6 months after the formation they played their first show outside of Sweden, and they also got be in CURE Magazine, one of Japan's biggest Visual kei magazines. Seremedy is a monster, growing for each day.